Happens all the time. You’re just lounging around, and doing nothing, and then, suddenly, a wild party appears. You need to be ready for this! 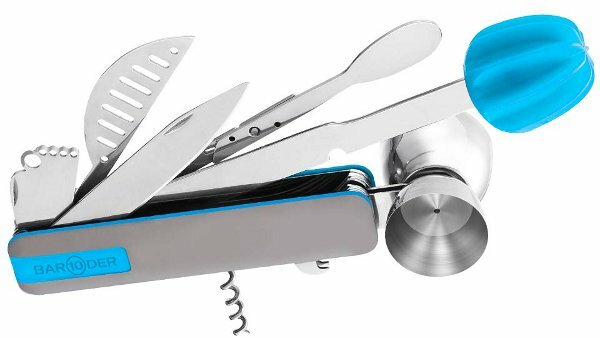 And nothing will get you as ready as this bar-tending multi-tool featuring every little gadget you may need in case a party breaks out. Because, obviously, you’ll be the guy behind the drinks, won’t you? Come on, you know you want to. The the Bar10der (such is it’s name) retails for $50 dollars, and includes a muddler, standard and channel knives, a jigger, a reamer, a zester, a stirrer, a corckscrew, a strainer, and of course, a bottle opener. Be sure to check out some of our other stories and gadgets at Sleek Billiard Ball Shot Glasses and G3 Ferrari Pizza: The Manliest Pizza In The World.